Parkin is gingerbread type cake that I first came across when I moved to Lancashire. 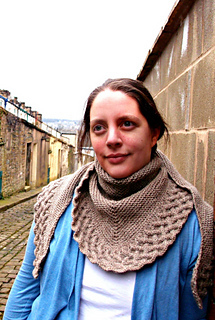 It’s warming, comforting with a tiny bit of spice -- a lot like this shawl. Miles of smooth, cushy garter stitch and then it finishes with a few rows of intense cabling. Where I live, the temperature doesn’t get that cold but the wind is biting. I need my shawls to be big and thick and warm and that’s just what this shawl is. The 200g of DK yarn used, which comes from a local company and is spun in a mill not too far from me, results in a heavy warm covering that keeps the wind out. 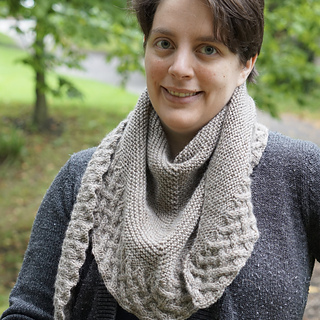 The construction is simple, it starts at the top and you work in garter stitch for one skein and then knit the cable border out of the second skein. It uses every last bit of yarn so make sure you get gauge or buy an insurance skein of yarn. The instructions for the cable pattern are both written out and charted so you can choose which one you prefer! 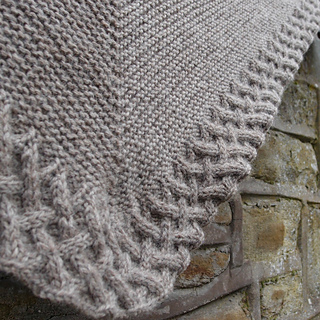 Gauge: 18 sts & 36 rows = 4” / 10 cm in garter stitch, after blocking.